By default, there is no validation on the input on the form that we have created. The validation code shall be put in the model file. The model file resides in <root directory>/app/models. For my example, the file is blog/app/models/test_j.rb. The TestJ class is a sub class of ActiveRecord::Base. The attr_accessible is to specify what are the attributes can be updated. 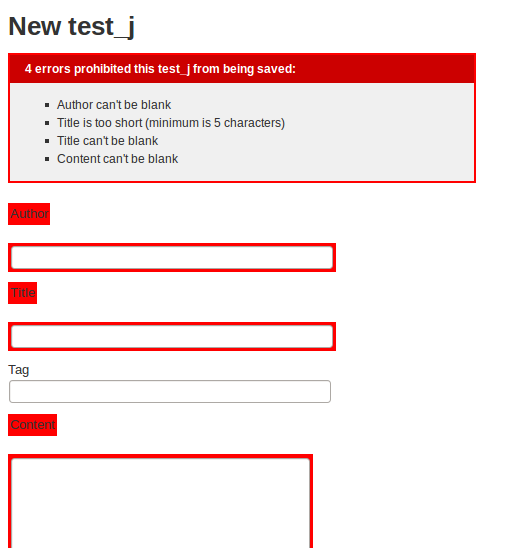 I tried to remove the tag from the attr_accessible and try to create a new record, this is the error observed. Back to the topic that I want to discuss here. Normally, in a form, we'll have required field. To validate the required field(s) has been filled, add the lines to validate the presence of the input. The length attribute controls the required length of the input of the field. For length, you can specified :in, :is, :minimum or :maximum. 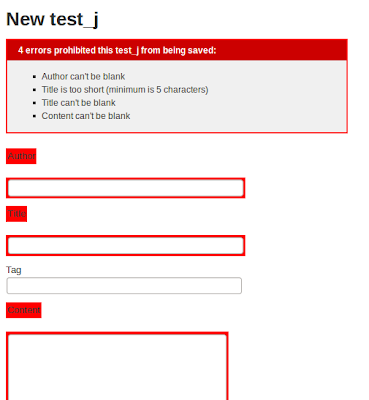 The application will have the default error message printed on the form if the validation failed.